Hey everybody! I've been reading around the forums for a while now, impressed by all of the hacks/edits performed on the GENS version (most notably the new Clockwise ROM and new stat creations). With the increased interest on hacking for the SNES side, including attempting to get 30+ teams and to deal with logos, I want to help out as much as possible. That said, the first thing we should do to streamline SNES hacking/editing is to compile all the information we have on the ROM in one location. 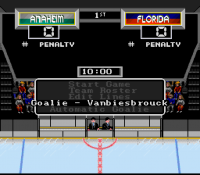 The eventual goal is to have a complete ROM mapping of NHL '94 for SNES (which I know will be difficult, but it can be done). For now, I have started a Google Spreadsheet to compile information related to locations of palettes and pointer tables I have found on the forums (click on the link below to view it). If you have information about any other locations of pointer tables/palettes/etc. that is not on the document, post it on this topic and I can add it to the spreadsheet. -I think this thread should have the data in it, too, not just as a link. maybe the in-thread text would be a streamlined version with the obscure or super-detailed stuff left to the spreadsheet. -why are you assuming a header? I don't mean "don't do that," I just want to examine the choice. when I hack, I don't add nor remove headers, I don't think, so which would that be? -I want to say I will be adding a lot to this, but I'm just not that organized. here's hoping I pull it together. we very much will benefit from an organized, central location to cull data from. -screenshots of the tile editing stuff would be nice additions to this thread. -I can stop dropping irrelevant hints about the need for such a project. 1. This is just a start. We can have stuff in both (I was imagining that I would make a reference document if people preferred). 5. I saw one of your posts mentioning the need for this, and I decided to follow through on it. I'm currently seeking fatigue and rest rates. might have to search for flipped hex data from the Genesis version, replace, test and repeat. ....header offsets to team data within each team are in Big Endian. Please note some of my notes/guesses may be wrong.... as I've never got into the SNES version to know any better (or care for that matter). Search for Hex 55000E00 to find the start header for all teams. 5500 - 0x000E3FB2 + 5500 (85 bytes big endian relative offset) = 0x00E4007 (1st Goalie Player Name Byte length of 0E00 - 14 bytes until Jersey No). 0E00 - 0x000E3FB2 + 0E00 = Pallete? 1D00 - 0x000E3FB2 + 1D00 (29) = best line - line changes off???????????? 0E00 - 0x000E3FB2 + 0E00 = Pallete? Same as above??? 1300 - 0x000E2857 + 1300 (19) = 0x000E286A. Bytes CBC0 - Amount of Goalies working from L to R... value > 0 = Goalie. Most likely acts as rating value of some sort too! As per the Genesis roms. Tested it within the SNES rom and worked as excepted... e.g. C000 only gave LA one goalie. Game Mode - 0000 for Regular season, 0100 for Continue Playoffs, 0200 for New Playoffs etc. 8 = Stick hand: Uneven = Right. Even = Left. Each teams lineup is in hex, between "team overall" and "number of players". In the following order: SC1, SC2, CHK, PP1, PP2, PK1, PK2. And each line is in the following order: G, LD, RD, LW, C, RW and then the extra attacker, when you pull your goalie. In 94, the single byte before the "team overall" bytes defines the amount of forwards and defense players. Anaheim for example has Hex 97, so 9 forwards and 7 defense players. Usual hex rules apply, A = 10, B = 11, .... F = 15. Game mode	0000 for Regular season, 0100 for Continue Playoffs, 0200 for New Playoffs etc. some notes on expanding player names for Statto's editor..
First, here is a document on pointers in SNES. They are waaay more confusing than in the Genesis. http://www.romhacking.net/docs/%5B50%5Dxcalpointers.txt. in the ROM, where there is a "U" character (value 55), since this character appeared right after all the rink names, except for the last team. So, my starting pointer is E2857. In SNES pointers, you only need the last 4 numbers in an address (don't ask why.. long story..), so you have 2857. Next, subtract the ROM header size, which is 0200. This gives you 2657. Next, you need the pointer's first digit to be between 8-F. So, if it's 0-7, add 8 to it. This gives you A657. Next, the SNES CPU is "little endian", so you reverse the bytes in the number, giving you 57A6. starting at byte 0, using Anaheim as an example. If you change the length of a player name, you need to change the values in bytes 4-5 to match the change. 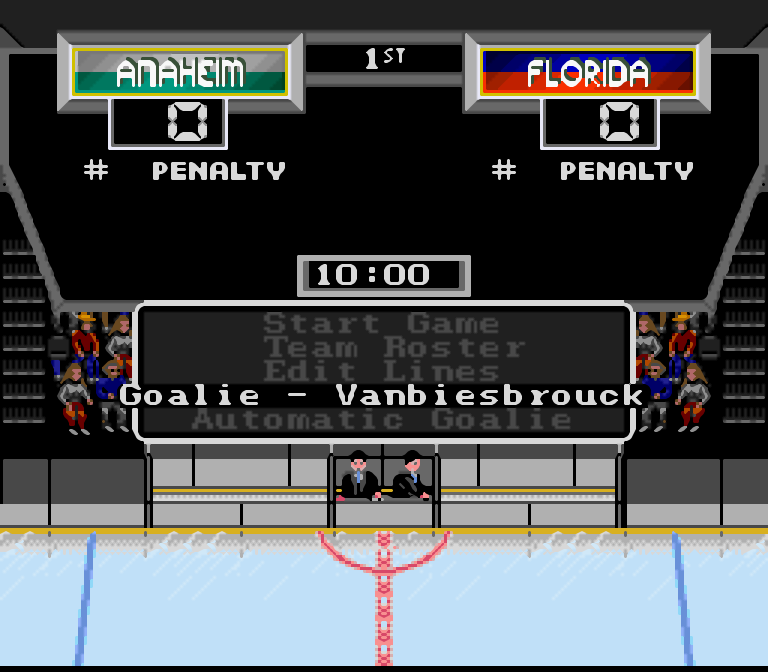 I was able to add letters to vanbiesbrouck's name! Copy data from E6B4D-E6F59. This is the FLA and ANA team data. 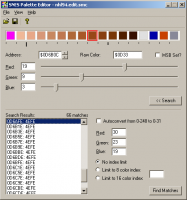 Paste (overwrite not insert) to E7B46. This puts FLA at E7B46 and ANA at E7D4B. Update the length of Vanb's name from 1100 to 1400. Because data was inserted, you need to remove some of the 'free bytes'. Delete 3 of the FF bytes from before E8200. Update the "player info size" value in the 4-5th bytes of the team data. Old value: DD01. New value: DD01+0300=E001. NOTE: The 'data' section of the ROM ends at 0E81FF. The code starts at 0E8200. You have to make sure the code section doesn't move. ....here are my notes from editing jerseys in SNES using a palette editor. The hex number next to the team represents the number '1' in the top part. If this doesn't make sense, too bad. EDIT: 0D5356 to 0D5382 is the PALETTE for the centre ice logos, not any information about the centre ice logos themselves. Still useful. I found it when I was trying to figure out the difference between DMA mode 0 and mode 1.
mode 1 is 3 layers + 16 colours per palette. mode 1 would be used when loading a player portrait, since they're 16 colours. i suspect mode 0 is used to show team banners (upper half of banner = 4 colours, lower half = 4, text = 4..), but that's a guess. EDIT: reading the document made me realize that banner idea is wrong.. the mode 0 stuff i was seeing was actually changing palettes..
$4203 to perform another multiplication without resetting $4202. That bit about cycles is important: after setting 4202 and 4203 (to say 2 and 3), you need to wait a while (run some other instructions) before the result is ready. Once the result is ready, you can actually set a new value into 4202 (say 10), then immediately pull the old result from 4216 (2x3=6) before it changes to the new result a few cycles later (10x33=30). So to make everyone average, it's 441111. I think I remember checking the genesis version and finding that offense/defense are never actually used, so can be ignored. I believe 70 30 30 gives the best advantages and 07 03 03 gives the worst. I've been making some progress on the player portraits in NHL '94. In the SNES version of the game, each team has 26 picture pointers allocated to it. This means each team can have up to 26 players with portraits. In the original NHL 94 ROM, only 6 players on each team (the starting lineup) actually have portraits, so their pointers point to their portraits, and the remaining pointers point to generic pictures. The exception to this is the All Star teams, which use most of their pointers, since most of the players are starting players on their normal teams. 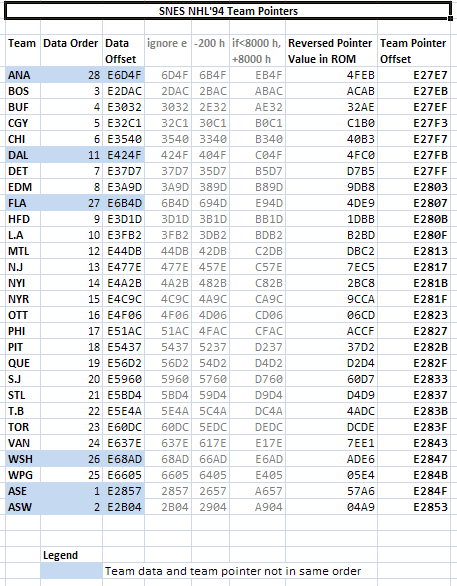 Within each team, the pointers go in the same order as the team roster data (goalies, then forwards, then defensemen). If the team doesn't have 26 players (none do, actually), then extra pointers still point to generic pictures. Starting at @0ecd53, there is a massive pointer table with 26 pointers for 28 teams. That's 728 pointers! As a pointer is 4 bytes and each team has 26 pointers, this means the start of each team is separated by 104 bytes ($68 bytes). The next pointer is $4EC69900. If you skip ahead $68 bytes (104 decimal), you'll see that the same pointer appears again. This is the generic goalie picture that the backup goalies use. A few teams don't have backups (NYI, NYR, to name two). I'll come up with an excel sheet with all the picture pointers some time. Immediately following the player portrait pointers section are the palettes. Each team gets its own palette. The palette is applied to any portrait loaded for that team, including the generic pictures. Colours 1-12: skin and hair tones. Colours 13-15: sweater and helmet colours. Sometimes used for black hair if the sweater has black. The fact that the player's hair and helmet will use the sweater colours will probably cause problems moving players between teams. * there are a couple teams that don't use magenta, they just use the grey/green background colour. Someone messed up! There are 25 palettes in one big group, and then the ones for Boston and Anaheim are crammed in elsewhere. The All Star teams each use the same palette (located between FLA and HFD for some reason), so there are 27 palettes in total. There is a pointer table for these palettes at $ED8B3. The pointers are in alphabetical order (ANA-WPG), and then the two All Star teams at the end. I think I found the decompression routine. Is this better than a thread guide? With a thread guide, you can fairly easily see all the topics, then follow the links to the a whole discussion on the topic you're interested in. At the least, you should provide a link to the topic you're quoting. On the plus side, you can eliminate the fluff and out-of-date info from the threads.. but what happens when the info here becomes out-of-date.. will people remember to update their quotes.. I don't know. I was just trying to cull some data from elsewhere and contribute. feel free to make another such link list. any work you put into the SNES side of things is greatly appreciated. I don't mean that your efforts in the Genesis stuff aren't, though. those efforts have surely helped me to actually enjoy those games through hacking. Oh I missed the spreadsheet. I like that... but I would add a column with links to the threads explaining those things. For a thread guide, do one of you want to take control on that? I wasn't a mod or anything when I set up the Gens thread guide. I like it all in one place, for my own ease of use, so... I'm not motivated to do it. I found the pointer table for center ice logos! They are located from @0E03B7-@0E0496 (headerless). It seems that the pointers are 8 bytes rather than 4. I'll update the Google spreadsheet. Experimenting with it, I found that if the second half is changed and the first half is unchanged, the logo gets distorted but the game is playable. By contrast, if the first half is unchanged and the second half is unchanged, the game breaks after the beginning of the game. Now we just have to figure out where the pointers for the logos in the main menu are located in the ROM. One would think since most of the pointer tables that have been found are in the Exxxx portion of the ROM, the main menu logo pointers would be there as well. Sounds like one half is the pointer to the start of the graphic (something like 34 12 9D 00?) and the other is something else, maybe the size of the graphic, or a second pointer to something else used for the graphic (perhaps the tile map -- the logos are broken up into to 16x16 and 8x8 pixel tiles that then are arranged to create the graphic.. one of the reasons I got discouraged working on it was I had no idea where the tile maps were in 94 or how they worked). I'll keep playing around with that pointer section in order to figure out how exactly it works. It might be the arrangement of the logo, as you mentioned. Does anyone have any idea about possible locations for the main menu team logo pointer table, or how I could figure it out with an SNES debugger? I am having trouble figuring out where it could possibly be. The centre-ice logo pointers are definitely logo/map pairs. The second pointer in each pair points to 70 bytes (46 hex) of data, representing the logo tile map. The first 6 bytes always seem to be 0800 0400 0803. 0800 (8 ) is the width, 0400 (4) is the height. I don't know what 0803 represents; I tried changing it and nothing happened. After that, you get 32 (i.e., 8x4) 2-byte tile IDs. So a typical logo would go 0000 0100 0200 0300, etc. saying to lay the tiles out in order. Some tiles will get reused. Some tile IDs have the form xx04 (e.g., 0004 0104 0204 0304). The 04 sometimes changes the colours; I don't really understand the point of it. Interesting observations about the center ice logos. They seem to work quite differently from other graphics we have found so far. the 8-byte "unknown" portion of the pointer table area I referred to in an earlier post is actually two pointers to menu logo palettes; one for the NHL shield and the other for the NHLPA logo. Thus, it seems like that pointer table area does not pertain to the logos in the main menu. One would think that there would be a 70 or 140 byte pointer table (if including the NHL/NHLPA logos, 78 and 156) somewhere in that references those logos, assuming that they work in a similar fashion to player portraits. So far, it's been quite elusive. I've been looking, but I don't think there's a pointer table anymore. It probably has something like a base pointer and then sizes or relative offsets from that base pointer. $1c94 is team 2's defense control and $1c96 is team 1's, or maybe vice versa sometimes, not really sure. This way removes the check against #0c and just sets both teams' defense control on. somebody stick this thread to the top of the page, please. thanks for sticking this. I come here often. that didn't seem to make it quite sticky enough. I want to gently encourage everybody to keep making progress. I sure could use some hand-holding. if anybody with the skills wants to help get a hack polished up, there are a few things I'm not comfortable with that others seem to have down. I'm still using initials for first names in the expansion teams (ANA and FLA) and there are plenty of things left to work on for adding to this thread. 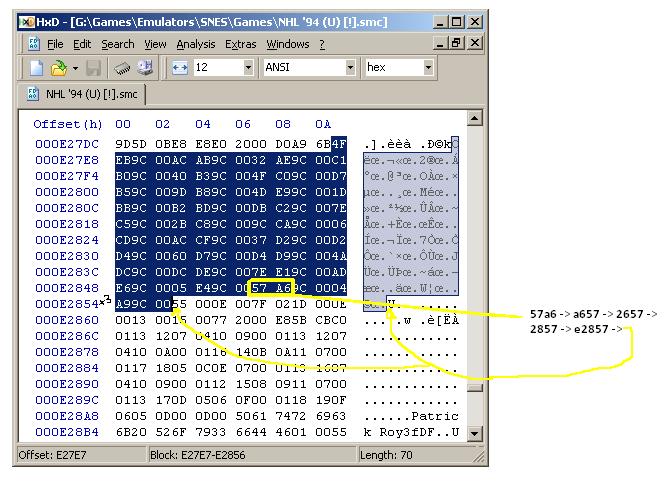 Get a hex-editor (I recommend HxD, very easy to use and very user friendly) and open NHL'94 rom in it. 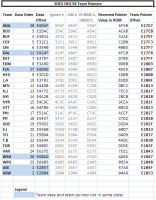 Center ice logos are located at E03B7 - E0496 offsets, find it with "Goto" option. The center ice logos offset stars with 7B B4 9A 00 3C E5 9A 00 A1 BF etc etc and ends with 88 00 B6 D4 9A 00 C6 FF 88 00. You can also find beginning of the offset with "Find" option, search for 7B B4 9A 00 in Hex-values datatypes. Yes, it's that simple, every line represents one center ice logo. For instance, if you want to change Quebec ice cener logo in your custom NHL 99 rom with generic NHL logo, just rewrite the values on the Quebec line (AF D5 9A 00 AE E1 9A 00) with the values from East or West line (B6 D4 9A 00 C6 FF 88 00). I bolded values which differ to frequent 9A value. 0D5356 to 0D5382 is the PALETTE for the centre ice logos, not any information about the centre ice logos themselves. Still useful. I edited everything from D5556 (D5356+200) to D5582 (D5382+200) with AA and then 00 and nothing happened. Bruins, Flames and Stars centre ice logos remained, unchanged. Menu logos always change color after editing menu logos palette offsets. Not sure if these are really center ice logos colors. Music is located from DB53F+- to DBFA1. Anyone knows where the organ tunes are located? rather than link to new developments, please continue to copy into this thread -- and keep updated -- any and all charts, rants, data that spell the larger book on our preferred game; this thread is meant to have all of the information a SNES hacker can collect from others to understand and/or build their own NHL '94. you seem to get a lot of this better than I do, so please help keep this thread well edited. rewrite, clarify, copy... keep bringing in content and get your first-line position secured. we are a lot closer to a map of this sucker than we were three years ago. you look to be the dude about to make the next set declarations. it had been well over a year that this thread was stagnant.